Enchanters: have you ever tried to accumulate reagents for your latest formula and come away feeling... well, disenchanted? Got Strange Dust when you really wanted Soul? Is that Brilliant Shard just not large enough to satisfy? Suffer no more! Through countless hours of research, I've discovered the scientific laws governing the mystic composition of enchanted items. I just *had* to build a gadget to make use of this knowledge. * Due to fluctuations in the astral plane, disenchanting an item of merely "uncommon" quality will still produce variable results. No one can predict for certain whether you'll get a pile of dust, an essence, or a shard, but thanks to my invention you'll at least know what variety of dust, kind and potency of essence, or luster and size of shard can be produced. Disenchantable items will also show information in their tooltip predicting which types of dust, essence, or shard they can disenchant into. Reagents produced by disenchanting items (a dust, essence, or shard) will show two new lines of information in their tooltips: the first shows which levels of items can be disenchanted to produce the reagent, and the second provides additional info on which types of items are more or less likely to produce the reagent. Also, you can use a chat command to check which types of dust, essence, and shard can be disenchanted from an item of a given level requirement. - Updated TOC to indicate compatibility with WoW Patch 5.2. - Fixed an issue where reagents could appear in the tooltip with "gibberish" codes before their names. - Fixed a "blocked action" error when applying glyphs since WoW Patch 5.0. - Fixed an error when disenchanting since WoW Patch 5.0. - Fixed incorrect predictions for Greater vs Lesser Cataclysm essences from ilevel 306-311 greens. - We no longer keep track of a list of non-disenchantable items (those which are green or better but which the game forbids disenchanting; e.g. vendor-purchased PvP gear), as keeping the list up to date proved infeasible. Disenchant Predictor may thus show disenchant reagents for items which the game forbids disenchanting (though it will still remember which items are non-disenchantable once it sees them so identified in-game). - Updated French localization by Xalenader. - Updated TOC to indicate compatibility with WoW Patch 4.1. - Adjusted disenchant information for Cataclysm greens (re: Lesser vs. Greater Celestial Essence). - Includes Spanish localization by PatoDaia. - Adjusted Cataclysm disenchant rates for Uncommon items to match recent patch/hotfix changes. 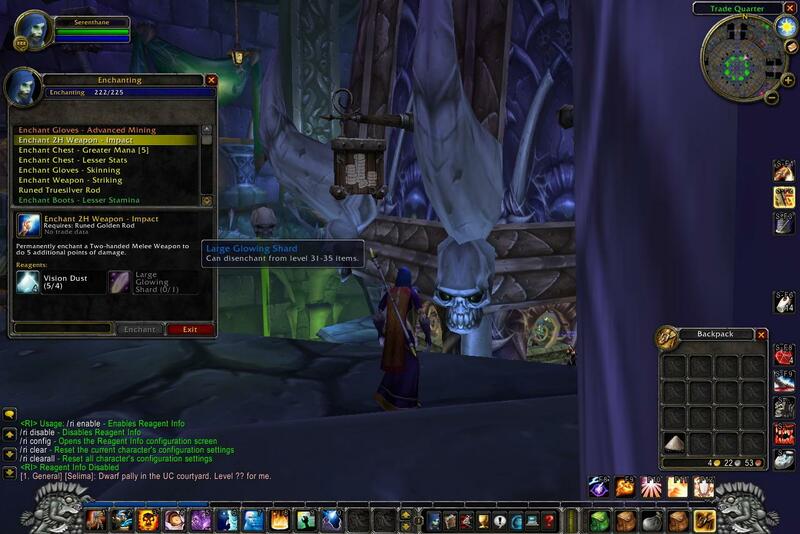 - Includes disenchant information for Cataclysm items (and fixes related errors). - Fixes some incorrectly reported disenchant information for other items, including frequency of essence/dust from armor vs weapons. - Updated for compatibility with WoW Patch 4.0.1 (and Cataclysm Beta). - NOTE: Disenchant information for high-level Cataclysm items is not yet available; this will be added in a future update around the release of Cataclysm. - Fixed an error which could sometimes appear when disenchanting items. - Updated TOC to indicate compatibility with WoW Patch 3.3. - Updated TOC to indicate compatibility with WoW Patch 3.2. - Updated TOC to indicate compatibility with WoW Patch 3.1. - Now uses Ace3 library for saved settings and options UI (any previously saved preferences will be reset to default). - Fixed an issue where preferences could fail to be saved between sessions. - Updated Korean localization from 'chkid'. - Fixed an issue that could cause disconnects when mousing over items. - Updated for compatibility with WoW Patch 3.0 and Wrath of the Lich King. - Tooltips for reagents now use an inline graphic to indicate which expansion's items they disenchant from. - We don't yet have enough data to predict all Wrath disenchants. Disenchant Predictor will show details in the chat window if you disenchant something that doesn't match its expectations -- send them in so future releases can be more accurate! - In Wrath content, there's no longer a correlation between items' required level seen in-game and the internal item level that determines disenchant results. So, tooltips for Lesser/Greater Cosmic Essence and Small/Large Dream Shards can only say "disenchants from lower/higher level Wrath items". 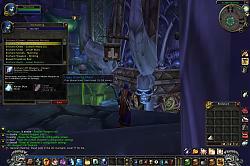 - Removed the Auto Loot option, as the one built into WoW works for Disenchanting now. - Now uses the Interface Options panel for configuration. The following addons are obsolete or otherwise no longer being updated. They probably won’t work on the current version of WoW, but old versions are available here in case other addon authors find the source code useful — follow the links below for lists of each addon’s versions. Disenchant Predictor: Slowly obsoleted by the long march of new WoW expansions. By now the only disenchant rule you really need to know is “disenchant loot from expansion X to get crafting mats from expansion X”, which isn’t worth maintaining an addon for." I see some of your other addons being updated for use with 7.0.3, is Disenchant Predictor going to be updated as well. It helps my DE alt ascertain if it's more efficient to DE and item or vendor it. Thanks. 1x [ADDON_ACTION_FORBIDDEN] AddOn "GFW_DisenchantPredictor" tried to call the protected function "CastGlyph()". Can you add the option so that the information appears when a certain key is pressed while the mouse is hovering over the item? Not sure what's better - the addon or your addon description. Hey, great addon, I've been looking for something like this! I have a suggestion though. Maybe you could show the average percentage chance you have to receive each item from DE? You could take the percentages from WoWHead. It's very good to know what I will and won't get, but I'd also like to know which item has a better chance of getting me what I want. This would be very useful for tailor/enchanters, so we can better decide which item to make to DE the mats we need! Highlord Darion Mograine: "We will see it through, to the bitter end." I recently dropped my herb (figured that if I really wanted herbs, i could stop being lazy and switch chars ) for tailoring, however to my consternation there doesn't seem to be (that I've found) an addon that has a 'drop zones' etc on cloth etc. The other mats, not as important, I guess, but cloth is driving me nuts. I was thinking of a tooltip hover on cloth that could list (via colors maybe?) the best/common places to get the cloth that you are hovering over. Obviously some of the the outlands clothes for the most part would just be "Outlands" and Frostweave "Northrend"... but it's the azeroth cloths that are driving me up a silly dang wall. I think everyone remembers where to get runecloth (well, a lot of people, I guess it's unfair to say everyone) but I had to look up mageweave, etc. Last edited by Jeania : 04-18-09 at 05:12 PM. Since wowinterface UI manager is no more support and also halt all the computer right now. Hope FDP can move to curse. It is a very good UI, hope to keep up to date all the time. think im exp the same dissconnect prob, but i cant say for sure this addon is the prob. anyway again not sure this addon is the prob, but disenchant info shows up twice in tooltips. thoght some other addon might already be doing this, but now turning of this addon removes both lines with DE info. anyone know what could be the prob. bloated tooptip sux. cheers. Seems he fixed the problem, so disregard. For whatever reason this version seems to disconnect me from the server when I open my bags. This is on a warlock without disenchanting. Don't know if it's that, a conflict with another mod, it trying to link something the server hasn't seen before or what. Going to try the one on Gazmik's site (if there's even a difference...). Same. And all I have to do is mouseover my bar. Default bar btw. A real pain in the neck.. because I love this mod.